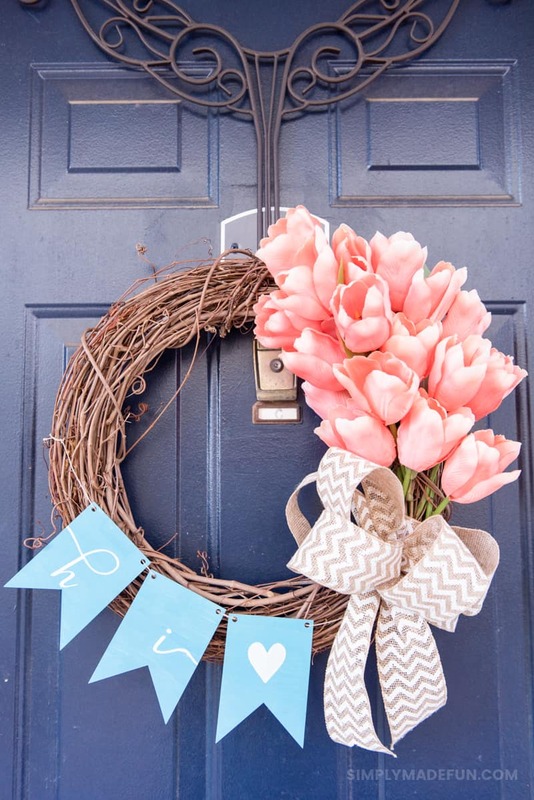 Add some bright colors to your front door when you use flowers to make a Spring Tulip Wreath! The Spring constantly seems like it’s being dangled in front of us and then quickly taken away. The weather can’t make up it’s mind, we’re supposed to get snow next week, and my winter jacket doesn’t look like it’s getting shoved in the back of my closet anytime soon. I’m so ready for Spring. All the colors, everything blooming (I could do without the allergies though), and warm weather to take walks in. I’m ready. BRING IT ON. The one thing I miss about our old apartment is that the front doors were a beautiful dark blue color. Our door now is red (I hate that color, fyi) so now I have to be very careful about what colors I put on my wreaths so that they don’t clash with the door. I’m trying to talk Chris into letting me paint it but we have to get approval from our Home Owners Association and I’m not quite sure I want to bother with it. So, for now, I’m dealing with the red. 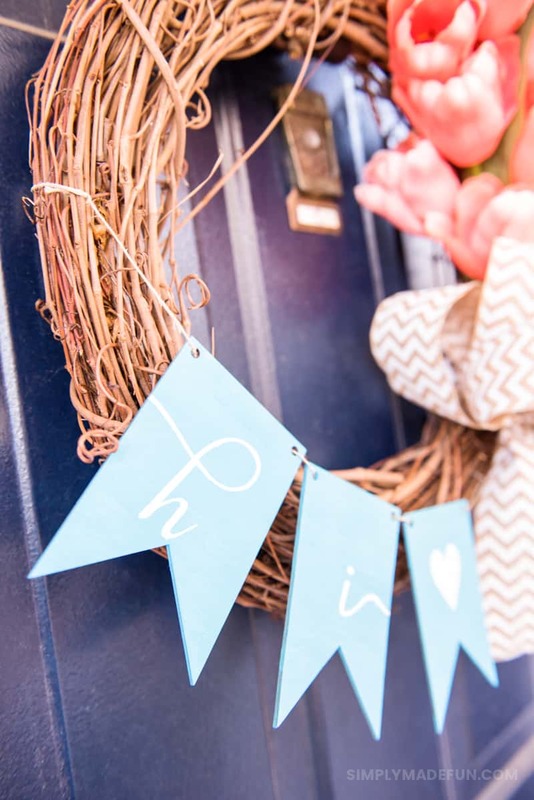 But I adore the blue because it gave me the opportunity to put a lot of color on the door, and the brighter the color the more it pops against the blue. That’s one of the reasons I always went for something bright and fun! When it comes to making wreaths I have three things I tend to use: a grapevine base, flowers, and a large bow. Sometimes I mix things up or add in new items, but every wreath of mine ends up looking very similar. I’m okay with that, really! I just figure it’s my own signature look. + Arrange your flowers and tie them to the wreath. I made mine cascade down the side and then cut off the extra stem so it wouldn’t stick out underneath the ribbon. + Wrap a piece of ribbon around the wreath and over the stems of the flowers, secure it with hot glue. Then place your ribbon on top of it and hot glue the two pieces together. + Paint your wooden pieces and set them aside to let them dry. + You can use a stencil for the letters on your wood pieces or freehand it (I used a stencil). Once they’re dry hang them on your wreath with jute string. This wreath is one of my favorites and it just screams Spring to me. I actually pulled it out of the basement the other day and I couldn’t help but feel a little sad that it won’t work on my front door. I’m almost thinking of hanging it on the door to the basement just to put it up somewhere. I love the Spring tulip wreath and am so sad that it just doesn’t work on our door anymore! If you’re in the mood for spring crafts, check out these favorites! For now I guess I’ll just dream of Spring and make some fun crafts while I wait for Mother Nature to get her act together. Anyone else tired of this never-ending winter? I love your spring wreath, I am in desperate need of a wreath. I also never really thought of just changing out the decor for the season. It would be more cost effective! Beautiful job!! Your wreaths ares lovely an sounds so simple to make. I love the multiple looks but those pink tulips really are eye catching. Sharing on twitter & pinning. Happy Spring! Thank you so much Marla! The pink tulips are definitely my favorite of all the wreaths I’ve made. I just love the pop of color!